In the world of sports, one of the things fans love to do is compare one player to another and debate which one is superior. In the hobby, the same sort of debates rage on, except in this case, it has to do with cards instead of athletes. There is no doubt that the 1951 Bowman Mickey Mantle rookie and the 1952 Topps Mickey Mantle card are iconic cards, but which one deserves top billing? 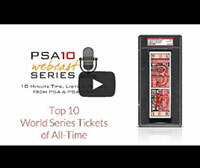 In the following article, PSA’s Joe Orlando breaks down the merits of each card. Mickey Mantle has long been a fan favorite in the game of baseball. In the hobby, there is no doubt that Mantle collectibles are in a class by themselves. While Babe Ruth might be the King of Autographs, Mantle still remains the King of Cardboard. There are cards that are currently more valuable, but is there any single baseball card more iconic than the 1952 Topps Mickey Mantle? That said, there is so much more to collecting Mantle baseball cards than just his 1952 Topps issue. In the following piece, we take an in-depth look at all cards Mantle. Over the years, there have been many interesting, and sometimes bizarre, non-traditional collectibles created for the hobby. This set is no exception. This 120-coin issue features an image of each player affixed to the front of the plastic coins. All six NHL teams are represented in the set with 20 coins per roster. Each colorful coin is numbered and the set includes several big names from the period like Jacques Plante, Jean Beliveau, Gordie Howe, and Bobby Hull. This 2014 award-winning set has a substantial lead on the Current Finest list and it carries a GPA of 9.88, the highest of all time on the registry. Click here for a look at this set. Offering an eclectic and enticing mixture of lots from Sports, Hollywood, Rock and History, Iconic Auctions’ Winter 2014 Auction of Autographs, Collectibles & Memorabilia is set to close on Thursday, December 18th. Lots for this sale can be viewed and bid on by going to the company’s website, www.IconicAuctions.com. This auction has a little bit of everything but A LOT to choose from. From vintage autographs to game used to current superstars it would be hard to find something you don’t love. Also included are personal items from the collections of Hall of Famers Bob Knight and Deacon Jones as well as the second ever Heisman Trophy winner Larry Kelley. This auction features many high grade and low pop cards for collectors to complete their sets from the 1950’s through the 2000’s. Rookies include Brooks Robinson, Bob Gibson, Pete Rose, Satchell Paige, Jackie Robinson, Roy Campanella, Duke Snider, Nolan Ryan, Tom Seaver, Reggie Jackson, Yogi Berra, Phil Rizzuto, Stan Musial, George Brett, Sonny Jurgensen and much more. This is another sale with tremendous investment-quality pieces from all sports and the historical and political worlds. It features another amazing array of items that caters to every level of collector and investor. Whether you only want to spend a few hundred dollars or several thousand dollars, our selection of quality items has a little something for just about everyone. 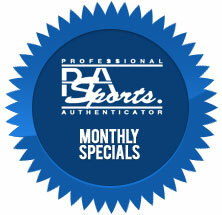 PSA Authorized Dealer Steve Novella (Estero, FL.) will be selling card by card on eBay: 50B BB (PSA 6 & 7) & 64TFB (PSA 8) & 66TBB (PSA 9). Grey Flannel offers Babe Ruth Tour of Japan, and more in its Holiday Auction, now live at www.GreyFlannel.com. The game-used Babe Ruth cap, which was sourced from the Ruth family more than 30 years ago, is the only example known to have been worn by the Bambino during his 1934 Tour of Japan, which took place only weeks after his departure from the Yankees. The Dec. 17 Grey Flannel event marks the first time the Ruth cap from the historic Tour of Japan has ever come to auction. The "Chesapeake Wagner," a recently unearthed 1909 Honus Wagner T206 card from a private collector living in the northeast, sold for $403,664 in SCP Auctions’ Fall Premier which concluded early Sunday. Which of the following 1950’s Mickey Mantle cards is your favorite?